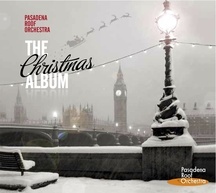 The orchestra's brand new Christmas Album is out now! After 42 years only! A Christmas Album from an established artist is normally quite high up on the recording agenda. In this resepct it might be fair to say that this project was a little overdue! Some of the tracks will be very familiar, others not so. 'It's Winter Again' or 'I'm Going Home For Christmas' for example would be a welcome 'new' addition to a Christmas playlist. The styles on this CD range from a pure Norman Rockwell like 'Rudolph, The Red-Nosed Reindeer' to an out and out swinging Dorsey style 'Santa Claus Is Coming To Town'. May you enjoy this album for this year, and many more to come.